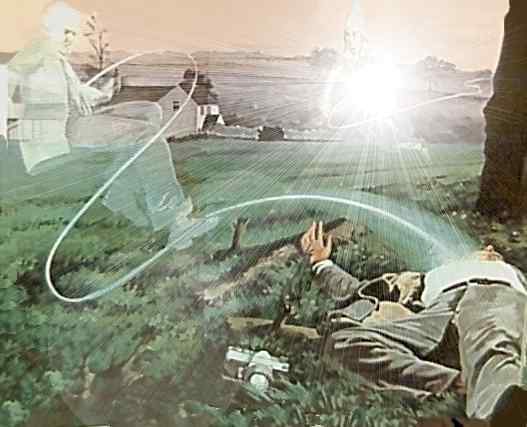 In February or early March 1967 a Puerto Rican man named Lester Rosas received several telepathic messages from two Venusians, Laan-Deeka and Sharanna. They promised that they would meet with him face-to-face one day soon. On the evening of March 31, acting under a strange compulsion, Rosas boarded a bus and took it to the end of the line, which happened to be along a coastal area. He kept walking until he reached a deserted part of the beach. By then it was pitch black, and he was unsure about what he was doing there and for what, or for whom, he was waiting. Then he felt an odd sensation as a man who had shoulder-length hair and was dressed in a close-fitting garment approached him. The man extended his hand, but when Rosas tried to shake his hand, the stranger withdrew it after a mild pressing of palms. 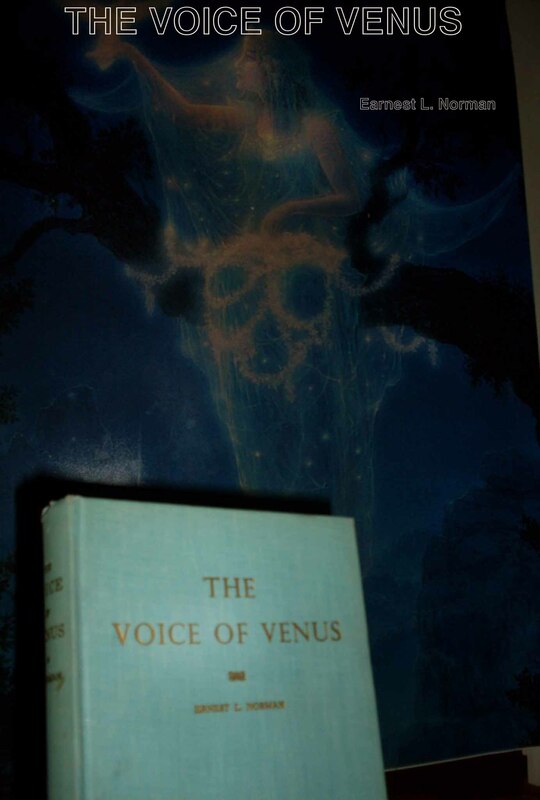 He said in Spanish, "Yes, beloved Earth brother, I am LaanDeeka, of the planet Venus." 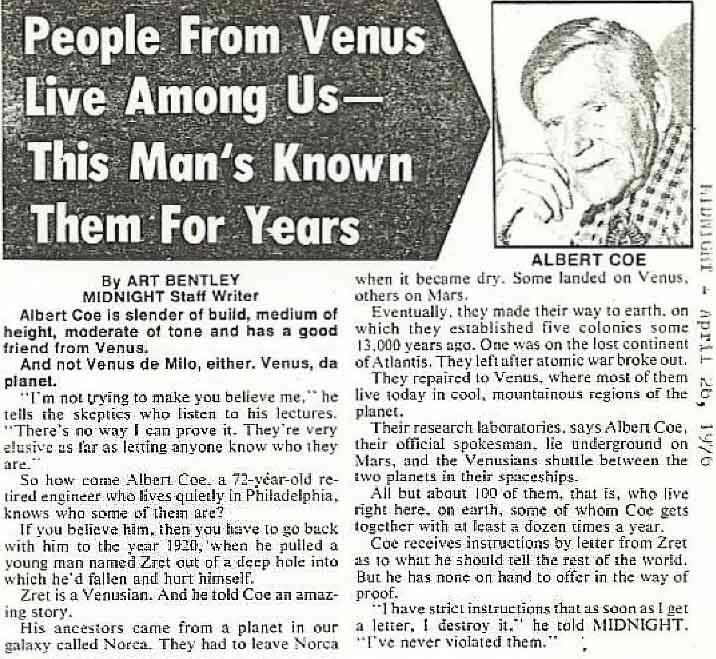 He went on to state that Venusians had been keeping human beings under surveillance since their primitive origins and had also been living, unnoticed, among them.  their next lives on spiritually developed planets. In the universe, he said, most communication, even interplanetary and interstellar communication, occurs by telepathy. 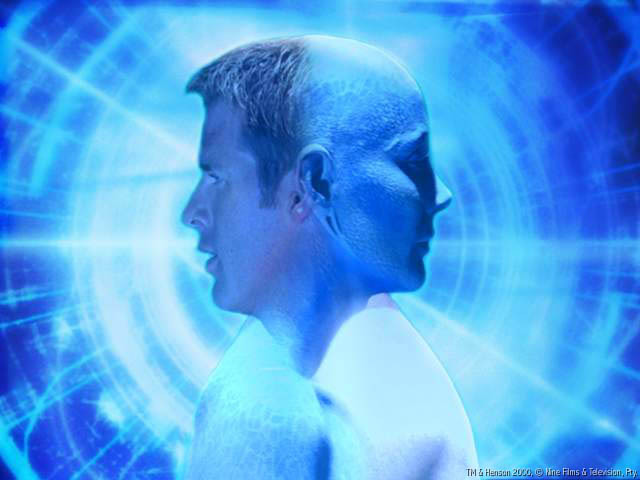 Human beings are backward, in part, because they fail to realize that telepathy is even possible. The Venusian led Rosas to the other side of a small nearby wall, where they witnessed the materialization of a flying saucer. A door slid open, and a woman emerged to engage Rosas in a palm-to-palm Venusian handshake. "She was so lovely that I was speechless for a moment," Rosas recalled. "Her hair was long and fair, and she had a fantastic figure. . . . I estimated her measurements at 5'4" and 37-27-35." She introduced herself to Rosas as Sharanna, Laan-Deeka's fiance'e. Though the couple looked to be no more than twenty years old, their manner suggested wiser, older persons. They had high foreheads and slightly slanted eyes, his green, hers blue. There was a musical sound to their voices, a sense of joy in their speech and action. 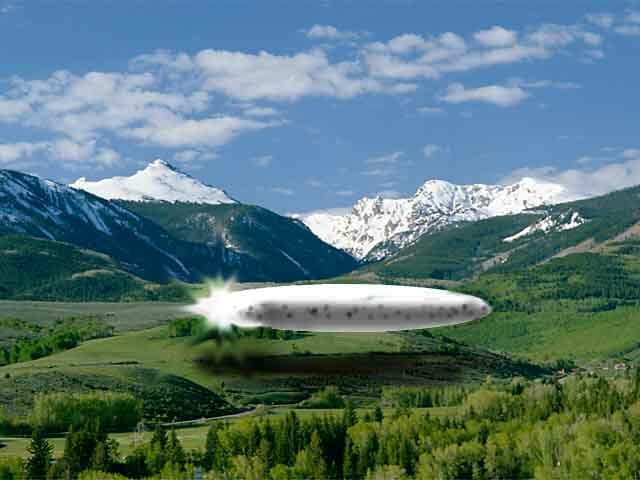 The three entered the ship and flew off to Venus, which proved to be the paradisiacal world reported by other contactees. On their way to the planet, Sharanna condemned the war in Vietnam as "senseless and stupid -as are all wars." She also criticized those who refused to believe contact stories. If contactees' reports are sometimes contradictory" she said, "it is with good reason. Your Earth people are contacting space people from different planets and different cultures, in different stages of advancement. .. . Therefore the reports could hardly be the same" (Rosas, 1976). A day in -67 the Swede Bjørn Ortenheim, had planned a suicide. Prior to committing the act, however, he lapsed into a deep, almost comalike sleep. When he awoke, he was mysteriously transformed, full of scientific ambitions and bold ideas. He soon became aware that other worldly entities were instructing him during his sleep. They were particularly interested in non-polluting technology and in other inventions that would elevate human consciousness. In 1981, the leader of the group, Power of Light (Ortenheim soon began thinking of him as POL), appeared to him in waking consciousness. art up - symbolic for a walk-in process - but a complete walk-in is seldom as in the Rampa-case - as picture below shows. 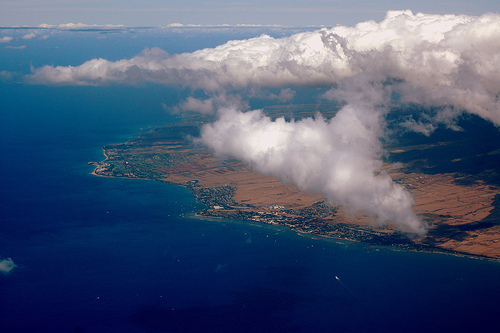 Ortenheim found himself ever more attracted to the Hawaiian island of Maui (picture left )POL informed him that Lemurian ruins with still powerful energies and vibrations could be found on or near the ocean. In fact, the capital city of Lemuria, Denerali, lay under the water in the bay outside Maui. POL said a large crystal from that lost continent existed there. Ortenheim should use its energies, employing his own technological innovations to enhance them, to raise human consciousness. He soon moved to Maui to pursue his work, always under POLs guidance. According to Ortenheim, POL is not a person but a near-god who is among God's highest servants. POL is, he says, "in charge of the ultimate energy and source of life in our universe, the Universal Magnetic Field, UMF"